My current favorite mushroom is the chanterelle, Cantherellus Formosus. They have a great texture, firm but not too chewy. My books say that they smell like apricots, although some beg to differ. I think it has a very fresh, floral smell. I also like that they aren’t dirty mushrooms like lobsters who grow in the duff or morels who harbor bugs. They are pretty easy to spot as well, being a nice yellow-orange hue. In the West coast they pop up in the fall, so the big challenge is to tell them apart from fallen leaves. On the east coast, their season is earlier and longer, from June to November. Their shape is elegant and stately, the cap grows up in a trumpet shape and has delicate ridge-like gills that travel down the stem. Technically, they don’t have true gills like your classic button mushroom. Their false gills look like wrinkles and they fork off along the underside of the cap. They are also known as egg mushrooms, girole and pfifferlings. There are many different types of chanterelles out there, including the white chanterelle which grows in the Pacific NW (I haven’t found those yet). My brother in VT commonly finds yellow foot chanterelles. On the East coast, they are mostly found in hardwood forests or mixed forests. In the Pacific NW, they tend to grow under conifers (pine, Doug fir) and oak. 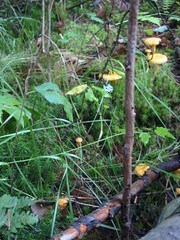 Chanterelles can be found alone, scattered or in large clusters. I prefer them fresh, but you can also dry them or dry-saute and freeze the mushrooms. 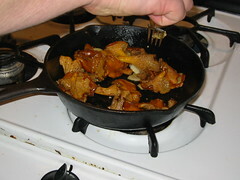 To dry sautee, just heat up a skillet and add the cleaned mushrooms. Once they have released their juices, they are good to be frozen (with or without their juices). Once frozen, they are good for a whole year to get you by until next chanterelle season. I have a batch in my freezer waiting for their future in a mushroom soup. I use them in any dish requiring mushrooms, but it’s good to eat them with simple dishes because chanterelles have such a delicate flavor. I tend to sautee them with some garlic in a mixture of olive oil and Earth Balance. I have no patience to make anything fancy with them, but the Wildman has an interesting recipe for a chanterelle custard I’ll try next time I have a batch in the house. Last, but most importantly, there are 2 look alikes for this mushroom. The toxic Jack O’Lantern (Omphalotus illudens) is very similar to the chanterelle, except that it glows in the dark and has very distinct gills that are thinner and more crowded. This website has really good photos for gill comparison. Luckily, it won’t kill you, just make you really sick. 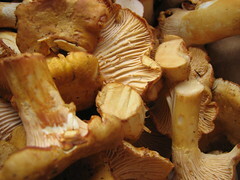 Jack O’Lanterns are always found on decaying wood or trees and grow in clusters, which is not true of the chanterelle. The other look alike is the false chanterelle, which is edible but apparently not very tasty. False chanterelles (Hygrophoropsis aurantiaca) look very similar to chanterelles, except that their false gills are blunt instead of sharp. I have read that false chanterelles could cause stomach issues and even hallucinations. I haven’t seen either in the wild, only the lovely chanterelle. What has been called Cantharellus Cibarius on the West Coast was discovered (DNA) to be a different species than the East Coast Cibarius. Our west coast species is now known as Cantherellus Formosus. Our west coast species does not have the ‘apricot’ fruity smell that is supposed to be a characteristic of the ease coast species. I’ve never smelled anything fruity in our species and I’ve never hunted them on the east coast to know. You wrote a good article though I’ve never had luck drying and then re-hydrating yellow chanterelles. They’re don’t seem to get any softer than shoe leather when rehydrated and cooked. I do dry them occasionally still but only to grind up into a powder for flavor or seasoning. The taste difference with white chanterlles is more in the texture department. They are denser/meatier. Though they can be found in great abundance at times (like all wild mushrooms), patches of them are not as abudant…they’re more solitary. Thanks Johnny for the helpful information. I couldn’t find a specific latin name for the chanterelle that grows out here. Originally from the East Coast, I assumed it was the same (or similar) species. I will update my blog to reflect the western species. Isn’t it amazing you can DNA test a mushroom? To rehydrate dried chanterelles, I pour hot water on them and let them steep a bit, but have only used them in pasta sauces or mushroom soups. I like the idea of grinding them to a powder. I’m currently dry sauteeing my chanterelles this year and freezing them, but when I run out of freezer space I plan to dehydrate. I agree, it does change texture. Nothing is like it fresh, eaten the day-of! Most of the chanterelles that I’ve been finding this fall have been in patches of 5-15. Thank you so much for sharing your expertise! I love learning more about this awesome mushroom. 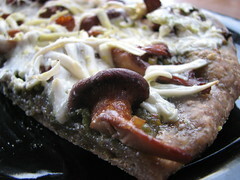 Mushrooms on pizza is my favorite way to eat mushrooms, but I’ve never had a mushroom as classy as a chanterelle on my pizza. Very nice!